Research-China.Org: Do Orphanages Really Want to Find Birth Parents? Like most adoptive families, I have always assumed that the orphanage directors and staff were looking out for the best interests of the children in their facilities. I assumed that efforts were made to locate birth families. In fact, in each of my daughters' certificate of abandonments it states that "we searched for her birth parents, but were unsuccessful." But several recent cases show that this is often not the case. These events show that rather than welcome the retrieval of lost children by their birth families, orphanages sometimes fight birth parents to keep the children for international adoption. In March 2006, families in this rural village filed a petition asking for the return of eleven children taken from them by Family Planning officials over the past four years (http://www.asianews.it/view.php?l=en&art=5696). One of these families, Yang Li Bing, stated that “his de facto wife gave birth to a girl in July 2004 and even though she was their first child, the county's family planning officers took the infant away on April 29 last year  citing an 'unregistered marriage and an illegal child'." Of interest to adoptive families is one key fact missing from the media coverage of this story. 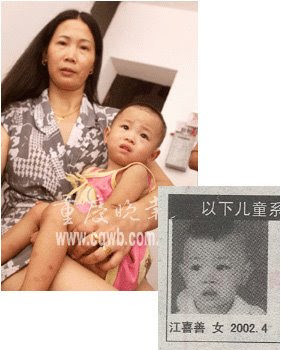 Yang Li Bing did not learn of his child's abduction by the Family Planning officials until late May 2005. Between his second appeal (told he could retrieve his daughter for 20,000 yuan) and his third appeal an important event occurred: The child's finding ad was published (June 11, 2005). It is clear that once the ad was published, orphanage officials were no longer willing to return his daughter to Yang Li Bing. In fact, they told him his daughter had already been adopted, when in fact she remained in the Shaoyang orphanage for another five months when she was internationally adopted by a family in the U.S.
A similar story occurred in Dianjiang County in Chongqing Province. Xu Shiyun, a teahouse owner, left his business to go to the nearby market. Unknown to him, his two and quarter year old daughter, Xu Tingting, followed after him. Ten minutes later, he returned to learn that his daughter was missing. After a frantic search involving scores of friends and family, Xu Shiyun contacted the police and reported his daughter missing. The next day, with still no word about his daughter, Xu Shiyun appeared on the local television and pleaded for information about his missing daughter. He gave a description of his daughter, her clothes, physical features, etc. Over the next few weeks, the father posted over 200 fliers around Dianjiang, hoping that someone had found his daughter. One flier was posted at the gate of the Dianjiang County orphanage. A week later, on July 31, 2003, Xu Shiyun had an inspiration: Perhaps his daughter had been found and brought to the Dianjiang County orphanage, located less than two kilometers from his home. As he approached the orphanage gate, however, his entrance was blocked by the gate-keeper. "We don't adopt two-year-old children," Gatekeeper Lao Daye said, "We only adopt disabled, or young children under 6 months. You should go to the Public Security Bureau to your daughter. " Feeling rejected but unsure that he was being told the truth, Xu Shuiyun returned the following week (August 8, 2003) and asked if he could look in the babyrooms for his daughter. He was rebuffed. "We can't allow anyone to visit any children's room!" Two weeks later, Xu Shiyun sent his wife, who was unknown to the orphanage. She claimed that she was interested in having the orphanage foster her young son, and wanted to see the conditions in the orphanage. She was taken to the various babyrooms, and anxiously looked into the face of each child, hoping to see her daughter. On the fifth floor, she was approached by a caregiver and told to leave. "Get out of here!" the caregiver yelled. "I am here to see how the conditions are like, since I might want to send our child here for fostering." In the midst of the altercation, two-year old Xu Tingting entered from the adjoining room calling "Mama." Xu Shiyun called the police and after presenting identification and proof that they were the parents of Xu Tingting, he was able to take the girl home. Her legs were scarred from more than 10 cigarette burns. Xu Tingting, whose orphanage name was "Jiang Xi Shan" had her finding ad placed for international adoption on August 15, 2003, after Xu Shiyun had approached the orphanage, and a week before his wife would finally locate their daughter. How had Xu Tingting get to the orphanage? Initially, the assistant director indicated she was found at the "gate of the water dike". When pressed for a more exact finding location, the director indicated that the gate keeper had in fact found the girl. Didn't you see the notices posted by the father on the orphanage gate? "No," the director responded, "we didn't know it was the same girl because the notice had no photo." But the notices did have a photo, he was corrected. After much interrogation by a reporter, the director finally admitted that the child had been brought to the orphanage by an unknown woman. There is little doubt she had been trafficked. Stories such as this turn traditional assumptions on their head -- "We searched for her birth parents" sometimes means "We prevented the birth parents from retrieving their child." Xu Tingting was fortunate -- her parents craftily entered the Dianjiang orphanage and retrieved their child, although her file was already on the way to the CCAA. Yang Li Bing wasn't as creative, and so his daughter was adopted internationally. Post Script: Some have questioned whether Xu Tingting was truly trafficked (sold for money) into the Dianjiang orphanage. A follow-up article to the one recounted above details how the trafficker was tracked down and interviewed. She recounted that she had purchased Xu Tingting for 500 yuan from another trafficker. She contacted the Dianjiang orphanage. "The orphanage, a man and several women, they accepted this little girl. They said they would give me 900-1000 yuan payment, but actually only gave me 680 yuan, as a reward for me." I am sickened that NSN IA from China is still happening. What the heck are we doing? Adopting children from a country that now has a horrible record of corruption and no one watching?! How does Jane Liedtke and yourself manage to find out all of this info and very large agencies have no info? How is it that these issues make the Chinese news and we get no hint that this could be happening? Has this issue been well known for a long time and people just chose to keep it quiet? How long has this been happening and why is it still going on? This needs to end. It needs to be made public knowledge and addressed properly and not just turned into something that was old news and that is changing because the CCAA is now on top of it! These are humans, little people that we love. Do you feel Jane Liedtke’s information is similar to what you have found? Jane wrote "Sometimes children are brought or left at the orphanage (or bought or transferred from another orphanage or are a relative of an orphanage employee or another option possible - women hired to have babies for the orphanage - ever think about that?) and they will not have a police report because the orphanage does not want to call the police to report this child because they want no record of the situation. While some children really ARE "left at the orphanage gate" by well-meaning birthparents and the orphanage didn't deem is necessary to report it, some are "left at the orphanage gate" as a way to explain the unusual circumstance by which they arrive at the orphanage, the unacceptable means to any society. There's a reason why China has imprisoned many orphanage directors over this." I don't understand the comment about the 10 cigarette burns on her legs. Do you mean that she had these prior to being in the orphanage, and they were identifying marks that helped her parents prove her identity, or do you mean that the orphanage caused the cigarette burns? Thank you for your courage in posting such a disturbing article. As a parent of five children (two adopted from China) knowing all the possibilities of their background is important. Oh my! The story about the little girl sent chills through my heart. My own daughter is from Chongqing. The orphhange was very careful about what parts of the building we could see when we visited. I do know that the overwhelming number of children at her SWI were handicapped. I guess there is a shortage at the IA SWIs for healthy adoptable children. I have warned people before about believing the stories they are told about the circumstances of their childs' abandonment. The "orphanage gates" thing is told over and over. The truth is you just never know. There are lots of older kdis abandoned for real but I am sure there are quite a few trafficked as well. Oh My God! What have we (IA parents) unknowingly done! Our desire to become families, Mothers, Fathers has made these orphanage people become the worst kind of monsters that prey on the weak and helpless (children and poor birth parents). I hope our children will forgive us! The article indicates that the burns were received in the orphanage. I think Jane has probably known of these issues for a while, but has chosen to keep quiet until recently in order to protect her business interests in China. Even now she refuses to discuss specific orphanages. I can understand wanting to reduce conflict with your benefactors (the CCAA), but I find hiding such information reprehensible. Brian, if all this is true, I don't know how you keep your children. Certainly, you must feel morally obligated to spend every last minute of your free time trying to make sure that you didn't steal your girls from the aching arms of their original family. Cigarette burns? Are all orphanages stealing children and torturing them? Just how widespread is this? I'm assuming it's blatant and happening all the time because you certainly wouldn't alarm us otherwise. My heart breaks for all of us with adopted children from China. You have access to so much inside information so I hope you find the strength to do what is correct. The fact is, no one knows how common it is because most people don't have the courage to fight the government, the government controls the press, and hush-money is dispensed freely. I can't rectify the past, but I can sure try to fix these things for the future. When a young little baby is stolen or sold I am sure they grieve. I would bet they want their moms. However their grief can be handled by swaddling a child tight and ignoring their cries. Eventually they stop fighting and just give in to what their reality is. A 2 and a half year old would obviously take some other measures to keep them in control and quiet them down. Cigarette burns? Donna asks, well would you not think that when this child screams for her mamma and they burn her and warn her, eventually she would learn to do what they say? "My heart breaks for all of us with adopted children from China." My heart breaks when I learn that people continue to defend a system that is sick and is fed by adoptive parents money. My heart breaks when I learn that children can no longer play innocently in fear that they may be snatched for a market. To ever suggest that Brian should give his children back is just plain idiotic. Brian simply posted a news article from China (along with the link). If you don't agree with this article or believe this is factual, contact CCAA and see if they can further explain. My heart breaks each time I read another story...I wouldn't change having my daughter in my life for anything...But having known three years ago what I know now, I don't think I could have adopted a NSN child from China. I have often wondered how many children are confiscated by the locl officials when a family has too many and then sent to the orphanage. I wonder if my own child was not bought by a broker or stolen or made for the orphanage to have more healthy babies. MOney corrupts everything. I wish more adoptive parents would listen to this information. They dont want to lose the fantasy. I am sure Mr. Stuy has tried to locate the birth parents of his daughters with his contacts. But what about all the children that are truly abandoned? What will your continued attacks about China adoptions do for them? In regard to the first case you mentioned from March 2006, it is a tragic case and in my opinion it is an abhorrent act of invasive government action. However, I think that your labeling it an abduction does not help in clarifying the issues or pointing toward solutions. I have no doubt that the parents experienced it as an abduction. But calling every case "abduction" and "child trafficking" throws everything in together. What most of the international community calls "child trafficking" does not fit this case. It is not a case of a child being sold, of parents being told a child will be educated when they will be used for sexual exploitation or labor, or of organized crime kidnapping and selling children. It is a case of government enforcement of civil laws that some of us find abhorrent. The solutions to child trafficking versus draconian government action are very different. Lumping all of these cases together obfuscates the solutions. The overwhelming majority of one-child policy violations (in this case a registration violation) are solved by issuing a fine that can be paid over a period of time. Most Family Planning officials live in the communities they govern, and thus are loath to upset what often are their friends and neighbors. I believe that the Shaoyang orphanage colluded with the Family Planning officials of Gaoping to abduct the eleven children simply to provide children for adoption. They demanded ransoms (as opposed to the normal fines) in an effort to extort money from the families. When a family came close to raising the ransom, they raised it again until it became impossible of the families to raise the funds. This was the intent -- to make it impossible for families to retrieve their children. This is not approved or sanctioned by the government -- it was a corruptive abuse by local authorities working in conjunction with an IA orphanage. I think it has always been the case that orphanages or the government are not looking to find the birth parents. Finding ads are done because it it a requirement for international adoption. I as an adoptee appreciate you telling the truth. I do have to wonder about those who say not to rock the boat or not all Chinese children are stolen. How many does it take for you to realize that it is indeed a corrupt situation? Can you at least picture yourself as one of these parents who has lost their child to child trafficking? If adoption is so wonderful, which child are you willing to give up? I imagine none. For me it would only take one child who was sold or trafficked. We are talking about children here. Human beings. "How many does it take for you to realize that it is indeed a corrupt situation?" It takes an overwhelming amount of time and energy just to get people to start thinking critically-- to get those blinders off so people can see the reality of IA! Then it takes even more work to get anyone to do anything about it!! Many a-parents have waited so long to be a parent that they will justify things until they no longer can. In the end, even when the truth is exposed and corruption revealed- governments, agencies and others in the business will simply say that it has been taken seriously and that the corruption has been stopped. Blah blah. It will be old news before it is new news. The truth is that as long as the program is running there will be corruption. NSN from China needs to end. "GOD has put us where we are suppose to be & if we didnt Adopt these children,they may Never know JESUS CHRIST & there soul is the most Inportant thing.even though this may be true,WHO wants to hear this.We can pray that things Will change." To the adoptive mother who said these words about this situation please think about what it is you are doing in the name of God. When people wonder who would ever defend this situation they need to look at you. You 'adoptive mother' are part of the crime if you continue to justify this! You are also an embarrassment to the adoption community. Thank you to the person who posted the above quote, which was taken from an agency's China forum. When I read that comment on that forum, it showed me what I believe to be the worst tactic used by some a-parents: justify a corrupt system by claiming that the children, no matter how they came to be available for IA, are better off being adopted internationally than staying in China. Those who use that rationalization use religion to justify their position. That is elitism at its worst. It makes me ashamed. word is often taken as the final say so. childs adoption from China, and there really is no way to find that out. to flee the scene because what they were doing was illegal. notion of what we have just done, by adopting them. then had gone unquestioned, because "thats just how it was in Cambodia". I in no way condone or seek to justify by any means improper actions by local chinese ajencies and directors -But I also do not want to lump / brand all IA children in the same situation. Your posts examples above are five and three years old and a previous/ recent post you quoted about a village in Yunnan having had children only to be adopted is a six+ year old story - I don't doubt these, but your inferance is these are all current. Do you feel that these are only the a overview of reported cases to make your genral point or is this the "tip of the iceberg". Regarding the Dianjiang story. The way I read it the authorities were called in and the mother provided identification and so their daughter was given back to them. In the Postscript, when you click on the source of the story, the page header is Chongqing News. Did the authorities not take action, either locally and in Chongqing? If they didn't, why? The stories are from 2003 and 2006. Now we know that these problems are not recent, but have been occurring for years. Know, for example, that Dianjiang has been purchasing children since 2003. We know from other stories (ABC News, etc.) that these problems continue today. The burns were received by the child in the orphanage. No doubt she was burned to stop her from crying for her parents. One might say she was tortured. In this case, the story wasn't about the police (although often it is), but about the orphanage director and his workers who purposefully obstructed a family searching for their child. THEY did not do their jobs, and in fact committed despicable acts by lying to the family. "Do orphanages really want to find birth parents?" Most of them, sadly, no. Not when there is $3,000 to make as a "donation" per child. Just as it is in Vietnam, Guatemala, etc., when there is money to be made, and no agency accountability on the US side, trafficking, kidnapping and shoddy adoption practices are free to fester. Why China is exempt in the public's eyes from corruption and greed is due to the incredible amount of PAP entitlement, denial of corruption, and agency fueled lies. The article about Hunan trafficking by Peter Goodman is the perfect example. The man was SLAUGHTERED by China AP's for addressing the problems. Others have been called racists, "ugly Americans" or accused of having hidden agendas for speaking out about shoddy adoptions. With this track record, who would want to be the one pelted with eggs? Why aren't the agencies saying anything? When the agencies are making 5 grand per child, the majority enjoying tax exempt status, many making huge salaries, and no one questions their business practices, why SHOULD they expose the corruption? It's the perfect con job! And now, AP's are left holding the bag of guilt and self-introspection, after they entered into IA with only the best of intentions. Yet, AP's continue to believe the agency spin. Why be angry at the agencies, when it's easier for them to shift the blame on the CCAA, PGN, the USCIS? The wheels of China IA have been coming off for some time. I suspect this is the beginning to the end of the road. Can't say I'm surprised given the slime I dealt with in our attempted adoption in China. My personal experience was far from clean, and most of the players were less than ethical. That doesn't mean that all agencies and all adoptions are bad, but I believe the vast majority are. What has to end is the paying customer's continued aquiescence to this type of corruption. Then, and only then, will reform begin. Sadly, by not speaking up to correct the corruption now, the ones who will pay are the *legitimate* orphans. And THAT is something to feel guilty about! Start by holding agencies accountable. Demand ethical and transparent adoptions. Ask questions. Demand your child's history (not 6 month old records or standard "fill-in-the-blank" answers). Want an agency to show how good they are? Don't count the number of adoptions as an indicator, but the power they hold to obtain reliable histories --- for a start. Issues of child trafficking for adoption are RAMPANT! It is impossible for adopting parents to determine the ethics of the agency they are dealing with or the true origins of the child they are adopting. This is true worldwide. as well as in domestic infant adoption. I understand that the directors of the orphanages want the 3000 dolalrs per child not just fo rhtemsleves but to help care for the children, mostly handicapped. that will live at the orphange their whole childhood. I can see how the desperate need to obtain funds would drive them to do illegal things. People want healthy babies not babies with handicaps. So there they are, trying to care for the ones no ones wants by selling the ones everyone wants to the highest bidder. If more people adopted the handicapped children I think this would help stop the traficking. Maybe this is why China has decided to phase out NSN adoptions and promote more SN adoptions. Great idea. I agree for the most part, but there are many reasons directors participate in illegal activities. Certainly they are under financial pressure, but one must also consider professional standing -- the desire to be the king of a large country (or orphanage). This desire partially explains the push to build large orphanages even while facing declining need. And there is, of course, the personal benefit directors receive in increased pay, greater access to funds for personal use, etc. Brian, I hope you will be reporting in upcoming blogs and posts to email groups the actions you have taken to alert the proper authorities and agencies about the corruption you have uncovered in the China IA program. If you don't plan to do this, why not? An in-depth investigation is on-going in China, and the results will be coming out later this year. It should present a clear picture as to the extent of the problems with IA program. Do you think there is a possibility that this report coming out might shut down the adoption program in China permanently? Such outcomes are impossible to predict. At a minimum it will provide data as to current problems, and hopefully spur change. "An in-depth investigation is on-going in China, and the results will be coming out later this year. It should present a clear picture as to the extent of the problems with IA program." Brian - who is doing this "in-depth" investigation? The U.S. State Department? My daughter is one of the many (from her SWI) who was "found at the north gate." She's only 5, but I dread the day I have to talk to her about her abandonment. I cannot even imagine explaining to her about the possiblity of being trafficked! Brian, have you had this discussion with your daughters? My oldest has asked about her birth mother one time, and has never brought it up since. Meigon is much too "in the present", and doesn't seem to have any curiosity about it at this point. I am sure it will come up one day, but we don't initiate discussions about it. Lan and I seldom discuss these kinds of things when the girls are around, although they obviously know a lot about children being adopted form China. Brian, who is doing this investigation that will come out later this year? Sorry, can't go into any details. The only evidence I have (and it is very small) is a second recorded conversation with the Changde orphanage (exposed by ABC News last month) saying they would purchase a cleft-lipped boy for 1,000 yuan. In the ABC News article they denied paying for SN children, but they told others they would pay. But my feeling is that the supply-demand dynamics don't justify purchasing of SN children. I have to stop coming to this blog. I have a darling daughter, adopted NSN from Chongqing. Never in all my thoughts, leading up to the adoption, did I have a glimmer of fear that she wasn't what they told me she was: an abandoned child. The thought that she could have grieving birth parents is simply too painful. I already feel awful for them, that they don't know this wonderful child. If I have to worry she's been stolen, I don't know what I'll do. And what will she think one day???? I sure don't want to lose you as a reader, but I seek only to educate families as the the current reality in China. That reality is that there is still a one-child policy that gives a preference to males. Families that don't want to keep a child are no longer facing hiding a child or abandoning her, but rather a spectrum of financial alternatives. Most continue to place the child with family/friends who they believe will be interested in keeping her, but a growing percentage also take advantage of the black markets that are prevalent. Many orphanages have recognized that if they don't compete effectively with these markets, that they will no longer receive healthy children to adopt to support their SN children, build bigger facilities or pay salaries. Thus, many are actively paying for children. Some orphanages take advantage of individual circumstances to obtain children, such as working with local Family Planning officials to do "confiscations" of unregistered children. This is little more than state-sanctioned kidnapping. Others work with doctors to obtain children by taking them from families who can't afford to pay medical bills. These activities must be exposed and stopped. The good news is that there are orphanages that don't participate in these nefarious activities. Not every child is trafficked, of course, but the evidence suggests that a growing percentage are. None of that means that there are birth parents seeking a child. I do believe that such activities are fairly rare, but do happen. Do you know if any of the staff at Dianjiang were arrested? Did the director get fired for allowing this method of obtaining children? Obviously if the orphanage is offering the rewards and this child was proven to be trafficked then other orphanages who offer rewards are not removed from this type of sick twisted scenario. Nothing was done, and the same players remain at the orphanage today. The sad reality is that nothing is done when it is discovered that directors buy babies. Nothing has happened in Changde, nothing has happened in Fuzhou. Only if it becomes a wide-spread international story like Hunan are remedial steps taken, but even those are inconsequential. Few of the directors in Hunan were even sentenced to jail, and only one served any time at all (3 months). That was a very damning thing to say about liedtke. I certainly hope you have real information on her and her motives, for if you don’t really know and are just guessing, what a vile way to smear her character. Saying something like that without proof would really make me questions your character and credibility. I was able to find a reference made by her in November of 2005 of child trafficking – stating she thought it rather naïve to believe it wasn’t occurring – also stating that family planning officials have themselves confiscated over quota children from parents and brought those children to the orphanage. (I have not used her services, nor do I have any plans to – but the attack on her character really caught my eye). I don't like the idea that children are trafficked in order to "fill the order" of IA parents; all children deserve to be treated as more than a commodity. So my question is not to justify the existence of trafficking. Certain things that you have said and I have read elsewhere makes me wonder if China views the buying, selling and/or transfering children in the same way as western countries do. You say that the orphanage directors involved with the Hunan trafficking scandal were not truly punished. Is this because CCAA WANTS IA to continue? Or is it because China itself doesn't see it as a big deal and only dealt with it because of international pressure and outrage? adoptive parents have kept their heads in the sand for years it's their problem not CCAA's problem." To assert that the adoptive parents are somehow guilty here is absurd. Adoption agencies, the CCAA, and many other "resources" have all been saying that Hunan, for example, was an isolated event, and that the system was clean. Monitoring the orphanages IS the job of the CCAA. To claim they are just paper-pushers is ridiculous. No one in the adoption community, and especially the world, believes that trafficking into the orphanages is common-place. Jane is trying to make this sound like old news, but it isn't. them and they want the CASH in their pockets. Does [the] CCAA know? Sure. Are they to blame? Nope. They may be anscillary [sic] to the problem but they didn't create the problem nor do they perpetuate it." Please!! If I hire a bunch of people to go out and find stereos to sell to others, and I ask no questions or express no suspicions when one individual brings in hundreds of brand-new stereos, I guess I can use Jane's defense: I didn't create the problem, I was just ancillary to it! I will, however, still go to jail. So, either she doesn't have a good grasp of what is happening in China (possible, since she does seem very busy) or she is doing her best to defend the CCAA from being part of the problem. When one looks at history, it is clear that the CCAA is very much aware (as Jane admits) but is also very responsible. mrkmommy: You ask the golden questions. I can only recount one experience I know of. In Guangdong Province in 2004 the CCAA ordered the examination of many of the orphanages. One orphanage failed in its inspection, and there were lots of questions. The director, however, was promoted outside the orphanage rather than fired. In the Hunan story we saw a lot of activity but little results. Of the six directors directly involved in the trafficking, only one served any jail time, and that was three months. So, I think it is safe to say that adoption "irregularities" are not treated very severely. Now, there is a cultural disconnect in all this. Most Chinese familiar with this problem, including those on trial in Hunan, feel it is a win-win-win situation. It is felt that the kids sold to orphanages are not wanted anyway, and the orphanage is doing their job to keep them out of the hands of traffickers or being left in a field. The program saves kids, brings orphanages money, and international families children. If it were that simple, I might agree. But the fact is, we don't know, and cannot know, what would have happened to the children. We cannot know how many women in China will get pregnant simply to sell the child for the money. We might save some, but actually produce more orphans at the same time. So, the answer is yes, there is a difference in perception on this issue. To take a position based on a Chinese woman having child for the purposes of adoption, you only have to look in any Adoption Magazine for a fee-based surrogate to further cloud up the issues. I have to agree with the previous poster - smearing Jane L. and then ripping her statements from her site and posting them onto your blog in order to defend yourself - is... unethical. Sorry you feel that way. Jane is an important source of information for families. I am simply pointing out that she sometimes isn't consistent in her assertions, or logical in her statements. I totally respect what Janes does, but when it comes to this issue I feel she is trying to walk too delicate of a line. To quote Bill Clinton's handlers - if you walk through a trailer park dragging a 100 dollar bill - you never know who will come out of the wood work or what they will say for that 100 dollars. Count me as another who thinks your statements about J. Liedtke are character smears. I, too, have never used her services (whereas I have used yours, in the past), although my family may do so in the future. Just out of curiosity, how do you know that JL "has not made any attempt to bring it [trafficking] forward"? A recent commenter in another "anonymous" forum has, correctly I think, made the point that you have been writing about the trafficking issue off-and-on for the past few years and promising upcoming investigations without ever giving any details about the who-what-when of said investigations. The more skeptical among your readers may be starting to think that your motives are driven by YOUR business interests. To wit, with the extreme slow down in China IA, your finding ad/orphanage pix business has to be way down (guessing here). So has your business in investigating for families whether individual children may have been trafficked grown to fill the gap? Just wondering. All this is not to say that I think China IA is without corruption, because I do not and corruption has been demonstrated. But your blog (a.k.a. marketing) writings are beginning to lose credibility in the face of your use of overgeneralization and now character smear. I, for one, will be reluctant to use your services in the future although I certainly hope for your girls' sake that you are able to continue supporting them. I doubt that many women would get pregnant to make money in China. Dont they risk being punished for having too many children? I think that might be one of those "what if " myths. Could happen but rarely does. I agree that it is a win-win-win situation. Less dead children left in a field, more kids for adoption and the orphanage gets more funds. Sorry, I just dont see this as a problem. These kids are not wanted in the first place. If there were women having kids to get some money would not the SWI's be full of healthy babies? I am sorry that anyone views my comments as a smear, that was definitely not my intent. My point was to show that she professes to have knowledge of corruption in China, and has been a silent voice (as far as I know, but I am not able to keep up on everything). If I am mistaken, I apologize. But I don't think being critical of someone is a smear. I am not able to control who does investigations or when. Obviously China is a very busy news country right now with the earthquake, Olympics, Tibet, etc. As much as I think this subject is important, the rest of the world doesn't view it with the same priority. I am hopeful that things will resolve themselves this year, however. I'm sure some feel that raising the ire of adoptive parents is a good business strategy, but so far it has proven not to be. A smarter business decision on my part would be to not bring up anything negative about the China program, promote the myth, and sell finding ads. That is the strategy employed by most agencies, and other "adoption" businesses. I don't want to operate that way. Ultimately, however, most families do seek to obtain information on their children, and our finding ads, DVDs, foster family and orphanage contacts makes us the only organization in a position to provide that information. Consequently, business is doing fine. There are many, many stories of entire villages of women getting pregnant to sell to traffickers, so this is no myth. It fact, in Yunnan Province it is practically an industry. How could anyone say that "these kids are not wanted in the first place" That is such a stereotype! Brian, I know you once did a topic about mothers not mourning their kids or something of that nature. I have to say that when we begin to talk about inner emotions based on external events which led our kids down the path they are on, that is when the slope gets waaaay too slippery! As for the Jane "smear", I guess some may see it as such and others may see it as bringing together all of these key people who claim to have insight into the international adoption program from China. So what if her comments are brought up here? She seems to be a pretty open figure when it comes to info about China. I wish people would combine their info and finally tell the rest of us exactly what the heck is really happening!!! This whole issue is getting to be too much. "There are many, many stories of entire villages of women getting pregnant to sell to traffickers, so this is no myth. It fact, in Yunnan Province it is practically an industry." This story was first published six years old -do you have confirmation that it is still ongoing? Yunnan Fazhibao, July 28, 2004. I am working on an article on reasons families sell their children in China, and will go into more depth on this angle of it in that article. I understand that this is on open question but If a child is reportedly abandoned on or about it's birthdate with a "red note", can we assume this is the real story or is this another "document" to support what they think you want to hear ladybug myths. A very good question! I have heard families assert that birth notes were made up and given them (all of the notes looked the same in an adoption group), but have never seen that first-hand myself. I have had someone tell me that the birth family wrote a note right before trafficking the child over to the orphanage, but again I have not seen anything first hand. In my 4 years working inside a chinese orphanage, I saw many times the children that were not considered for adoption because they weren't pretty enough, or because they had a small disability. With one specific child, we tried for two years to get her on the list for adoption---but there have been excuses, excuses, excuses as to why she "cannot" be adopted. One more thing...I had a very close relationship with many of the ayis (nannies) and they told me that the child I was trying to help get adopted, Xiao Gou, was only there a few weeks when her father came to the orphanage to try to reclaim her. (he had left her at the hospital after a tragic accident that left her an amputee and him unable to pay the bills) and that the directors refused to let him see her and told him to go or be arrested. I begged the director to find him again and that I would pay the hospital fees in order to reunite Xiao Gou to her parents that she was missing so much (she was 4!) but was told that it was impossible. Through the next year, the nannies told me that the parents were always close by the orphanage and "watching" their daughter from afar. One that I think will utlimately be a significant contributor to China's failure to become the world power so much desired by their government. I don't know what to think of this article and all the comments from so many people who obviously think they are experts on this subject. I have three adopted children from China...one NSN and two SN...and I wouldn't give them back for anything! They are ours now! When we adopted our first child from China almost five years ago, we thought it was a legitimate program and never gave thought to the fact that something could be underhanded about it at all. I am glad my children have life and were not aborted or killed. One of my SN's children was abandoned and attacked all over by ants, leaving terrible scars, so I know it was not fabricated that she was abandoned. I am glad that corruption can be exposed but for any of you who are condemning adoptive parents, get off your high horses and tell me you are perfect!! My husband I know this was what we were supposed to do and we are not feeling guilty at all for giving our children a loving and stable home! I am new to this blog. I really appreciate all the information Brian has put out there. Lots to digest, discuss and debate. All the discussion of corruption in the China IA program is eye-opening and extremely disturbing. We adopted our wonderful daughter in September 2005. At that time, we truly believed that China was the best adoption option for us, as it was the least corrupt (compared to say, Russia), and so many young children needing homes. We did not feel prepared to adopt a SN child (from China or the US), so we were indeed wanting a healthy child. Not long thereafter, the news of Hunan came out. I recall just being sick to my stomach for a few days, then I pushed it aside, focused on raising our daughter and being thankful that she did not come from the Hunan provence ... but still, I know that the possibility exists that she was not truly abaonded by parents who could not take care of her. We received the finding ad from our adoption facilitator in China; I'm not sure how long she had been doing that, but it was clear she did this as part of her job, serving western families who cam to adopt. She was very honest with us when we asked about the process the local authorities used to search for the birth parents of babies brought to the orphanage. She said they publish the ad, but they don't really look - they've got too much else to do (her words). We just assumed there were too many abandoned babies for the authorities to feel like they could effectively search for birth parents. We are not planning another adoption, but knowing what I know now, if we were, I would consider only SN from China, or not China at all. I look forward ot reading more articles essays and following debates. Brian, one question: what is your take on Half the Sky, as far as it being an effective organization to which to donate resources. Our daughter was from the Beihai City SWI (Guangxi AR); Half the Sky operates there (and we received a fair amount of documentation from them as to our daughter's last few months in the orphanage). Thanks for your work, your persistence and your time.